In addition to regular brushing, X-ray images of a cat&#39;s teeth can provide a veterinarian with clear details of the roots of the teeth without other overlapping structures confusing the diagnosis. Who has a dog (or cat) that enjoys licking you and being right up there in your face, giving you love all the time? I know I do, and boy do they surprise you with stinky breath sometimes. That stinky breath doesn’t have to stay and may be indicating that your dog or cat needs its teeth cleaned. Many veterinarians are very passionate about dog and cat dental health. 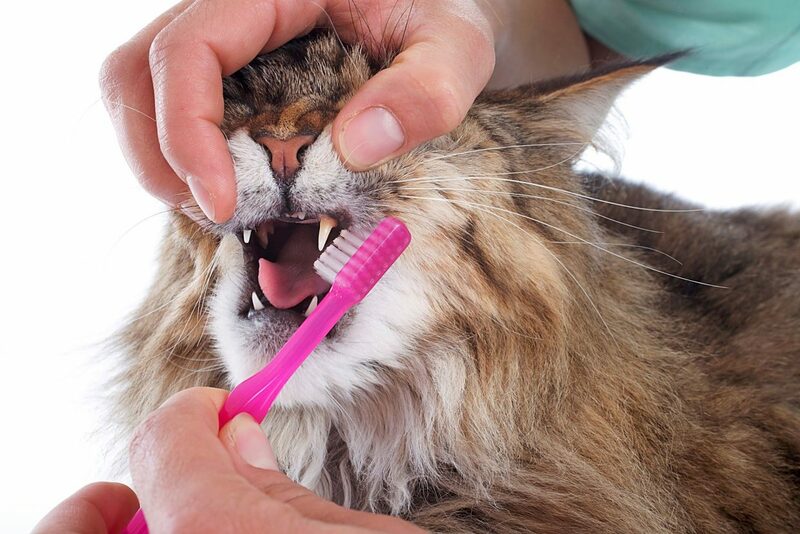 Cleaning, scaling and polishing (brushing) the teeth is crucial in order to maintain good dental health, but there are other things that are recommended to help ensure we are providing everything your pet needs to maintain the health of its teeth and mouth. Dental X-rays are vital to diagnose and treat various forms of dental disease in our pets. We use dental X-rays to evaluate the roots of the teeth and the surrounding bone that holds the teeth in place. Seventy percent of the tooth is located below the gum line; therefore, taking X-rays of all of the teeth is crucial for us to be sure we are doing everything that is needed in order to maintain proper dental health. Many times, by performing dental X-rays, we find disease that is actually worse than what we can detect with our eyes, hands and probes. Even when a tooth looks completely healthy, there can be problems brewing under the gum line and in the bone. Dental X-rays are taken by placing a sensor, or film, in the mouth of the dog or cat. We place the film in specific locations to take the image of different teeth. The X-ray machine must be carefully lined up so an accurate image of the tooth is obtained. We see so many different sizes and breeds of patients that each patient needs unique placement of the film and X-ray machine. These images then provide us with clear details of the roots of the teeth without other overlapping structures confusing the diagnosis. Cleaning, scaling and polishing an animal’s teeth, as well as dental radiography, are a crucial part of maintaining oral health in every dog and cat. In order to clean an animal’s mouth safely and thoroughly and to obtain dental X-rays, your pet needs to be placed under general anesthesia. This is so we can clean the teeth well, protect the airway and keep your pet completely still in order to do a deep cleaning and obtain the perfect X-ray image. In addition, it may be a little uncomfortable to have the sensor in the pet’s mouth, so we want it to be asleep so that we lessen its stress. Visit your veterinarian so he or she can perform an oral exam to ensure your pet is in the best health possible. It’s Dental Health Month at many veterinary clinics in the area, so give your veterinarian a call and have him or her check out your pet’s mouth to see if it needs a dental cleaning. Happy September, everyone!